One day the manufacturers at the Pocky geniuses decided to make ice-creams made out of the fondant on the Pocky sticks. 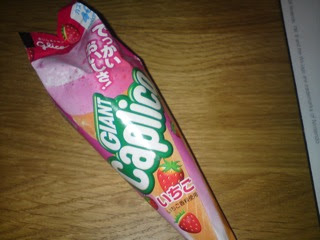 Then someone decided to make a giant version that was the same size as a real ice-cream. This is that product. I've had this for almost a year in my pen pot on my desk as an 'emergency review' as I really didn't know when to eat it. Unlike real ice creams it's not suitable for hot weather and as it's a whole lot of sweetness I thought I'd need to be in the right mood. In the end I ate it instead of dinner one lazy day when I was distracted by the computer. Turns out it's a different beast to what I'd expected. 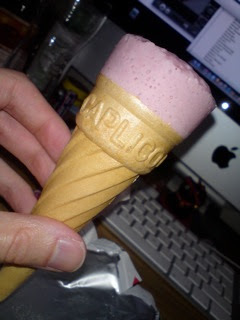 The presentation is perfect, it looks just like a Cornetto style home ice-cream except for the no drip no melt features. It does however crumble! After each bite I was picking up little shards of Pocky fondant off the wrapper on my desk and it was quite a fun & childish experience. The centre is brown chocolate flavour fondant and the outside is strawberry and very very similar to a typical Pink Pocky. It's less sweet than I'd expected which is a real bonus as there is an awful lot of the thing to eat. One sitting was enough to finish it off and the wrapper had kept the cone still crispy and intact. I can't say I'd need to go out and buy these on a regular basis, but the whole experience was a whole lot of fun so a great treat for kids and childish grown-ups if they are around this summer too. Wow this looks like so much fun! Love the design of it!